Homoeopathic medicines have been around for centuries as an alternative treatment for any number of sicknesses, pains and other problems. Many parents find that these medicines can help their children without needing to use potentially harmful chemically based drugs. Whether children actually know or sense that homoeopathic medicines are good for them or not, they deserve safe medicines. It is time that parents and physicians seek safe, natural and effective alternatives to conventional, potentially harmful drugs. Homoeopathic medicine is one such alternative. Many parents consider homoeopathy a Godsend to their children as well as to themselves. With today’s parental concern about interactions, side effects and contra-indications of prescription and over the counter drugs, the homoeopathic method, which is free of these causes for concern, is enjoying a popular revival. Homoeopathy is natural and mild medicine. The remedies are natural substances which have been diluted and potentized many times so that when used according to the homoeopathic method, they stimulate the child’s own defenses to move your child toward a healthier state without causing any side effects. The fact is, homoeopathic remedies are examined by the FDA (Food and Drug Administration). This ensures that they are available under scrutiny so that the user can rest assured of the effectiveness of the product. Since they are produced from herbs, plants and various other natural substance, they are without the side effects (if any) of traditional medications. Additionally, the medicine is so dilute that it is not an issue for infants and children to digest it however it is still effective in the body. Even over the long term, there aren’t any bad side effects. Homoeopathic remedies are able not only to relieve many common acute problems of children, but can help prevent recurrent bouts of illness. And homoeopathic medicines can treat both physical ailments and emotional upsets. Homoeopathic medicines can be quick and effective for treating infant teething or colic, turning cranky babies into giggling cherubs. They can reduce the pain and discomfort of a child’s earache, which sharply decreases the need for antibiotics or ear tubes. They can strengthen the child’s own natural defenses so that he can fight off that cold or flu that every other kid in school seems to be getting. And they can benefit the hyperactive child, helping to calm his restlessness. The care that conventional physicians offer is often valuable, but powerful drugs are dispensed far too frequently by too many doctors without an effort to try safer, more natural therapies. It seems prudent to save the bigger guns for the more serious conditions that warrant their use. We wish our little ones to savor health in their bodies without all the chemical substances and side effects that some remedies can bring about. 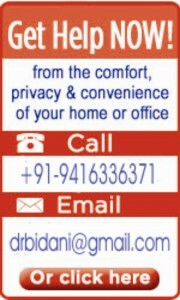 Homoeopathy at Dr. Bidani’s Centre is an option where you can have your children in safe and secure hands.